Can a prayer be inspired by a battle? 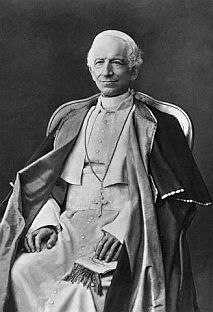 Pope Leo XIII (pictured at right) wrote the Saint Michael prayer, printed below, in 1884, after supposedly seeing a frightening vision: evil spirits, trying to fulfill Satan’s boast to destroy our Lord’s Church within a century, were engaging in fierce attacks against it. St. Michael’s very name (in Hebrew, Micha’el meaning “Who is like God?”) denotes the war cry uttered in that battle. Note that when we talk about Satan or the devil here we are also referring to his “army” of fallen angels, the evil spirits referred to in the Saint Michael prayer. 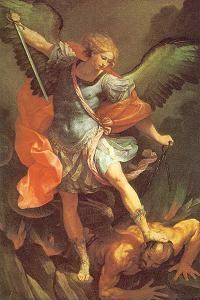 On the subject of resistance, keep in mind that we can and should say the Saint Michael prayer at church or just on our own during the day for spiritual protection for ourselves and for others as well! Satan was unable to destroy the Catholic Church in the 20th century, but certainly our faith withstood terrible onslaughts just from Hitler and Stalin alone. We are still engaged in that war that has gone for all of human history, in one form or another, between God and the devil. Let us not be afraid to ask for St. Michael’s help in this prayer and others like it. We need to remember that each time we pray we work to defeat our real enemies, not each other, but rather the devil and his evil spirits.